DUMBARTON faced full-time promotion hopefuls Queen of the South in front of a nearly 1,000 crowd at the Cheaper Insurance Direct Stadium — and could not match them. Stevie Aitken's men could not make it three wins in a row against full time clubs, with Queen's looking a much better team than either Hibs or St Mirren and deservedly winning 2-0. The visitors did not have star players, but they played hard for each other and rarely wasted a pass. The home side tried hard, but too often passes went astray. Who else but ex-Son Iain Russell, who loves scoring against Dumbarton, opened the scoring when he met a good cross at the far post and netted easily. It remained 1-0 until the interval. After the break it was a similar pattern, with Queens adept at closing down attackers then breaking upfield. On 68 minutes, shortly after new signing on-loan midfielder from St Johnstone Scott Brown had come on for Kevin Cawley for the home side, the visitors made it 2-0. Sons failed to deal with a fairly straightforward low cross, and keeper Mark Brown could not stop Derek Lyle heading home unhampered from close range. There was no way back for the home team. Manager Stevie Aitken was still pleased with gaining six points out of nine in the first three games. 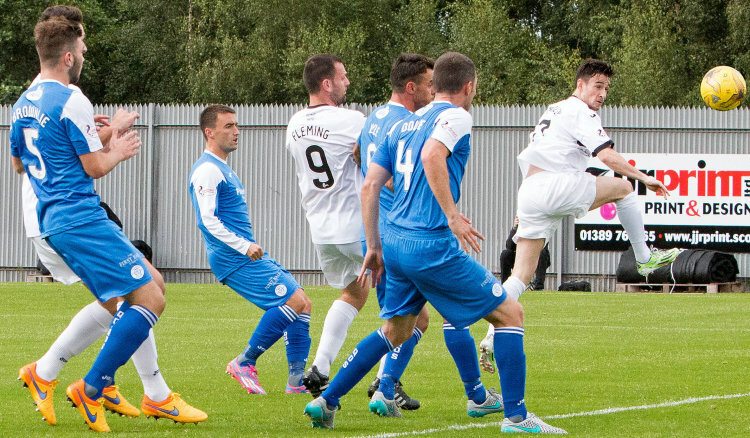 The picture shows Mark Docherty heading for goal.